There’s a reason why we humans are so fixated on curves, and no, it isn’t much to do with the “boys will be boys” syndrome, but more to do with the internal wiring and circuitry in our brains. Instead, putting it simply in medical terminology – it’s all to do with the anterior cingulate cortex part of our brain and the natural cognitive makeup that we’ve all been naturally gifted with, nothing else. Psst! That does explain a lot of things now, doesn’t it?! What’s The Deal With Curves, Anyway? If you think about it, humanity innately seems to be drawn to curves because it’s only ‘natural’ to do so. Nature does have myriad profusions of fluid arcs, bends, and bows in a vast majority of its forms - flora, fauna and otherwise. This probably also explains why some of us are more attracted to fluid, curvy bends as against vertical planes, lines and rectilinear forms – a theory that has found its way in modern-day interior designing. 4 Ways To Get A ‘Curvelicious’ Home! What would you prefer, a sleek, sharp-edged rectilinear sofa or a soft cushioned, rotund, cozy, liveable one? Our bet is you’d choose the latter. And the reason for this choice is that rotund furniture and round home decor objects soften, mould, meld, surrender and yield unconditionally to YOU and YOUR needs. In other words, the neuro-biological impression is that they mean no harm, present no danger and hence, are a safe place to relax and let go! And guess what? This is the reason why round is the new black in home décor trends. In smallish spaces, fluid bends and curves work to make the room appear more inviting and friendly. In larger sized apartments and offices, the roundness of lightings, curved sofas, and fluid curvy shaped architecture works to take away the coldness that usually dogs large sized places and replaces it with warmth and welcome. Of course, this might go against the conventional stripes and straight line texture mentality that we see most popularly these days but think about unconventionally curved surfaces on walls, and you’ll take an instant leap from ‘cold’ to ‘comfy’ in a heartbeat. Nature-based atypical wallpapers with curvy backdrops and unconventional soft swirly finishes on high ceilings offset the boxiness of square shaped rooms and neurologically speaking, even help to elevate an inhabitants imagination and creativity. Contrast stripes and geometric patterns by way of wallpapers & wall surfaces that wouldn’t usually strike you at first thought, and you’ve got yourself a beautiful cocoon that will be a talk of the town. Believe it or not, the kitchen can be a living testimony to the surprising warmth of arches and curves. Sure, it may not be the most popular place in the house where one can slip in curves, but that shouldn’t stop you from going ahead with it. After all, this is the one room in the house where the sharpest lines are most likely to appear. Cabinets for appliances, storage cupboards, counters and tables, lights and the entryway to the kitchen are some of the areas that can follow a curved theme. Intersperse it with a dining table and round chairs with curved arms combination, and you’ve got yourself the warmest, coziest, most homely part of the home – The heart in the hearth in the house! The beauty of curves is that you don’t need to make huge civil changes in the house to achieve curveliciousness - Start small and work your way from there on. Let round objets d’ art become the starting point from which you depart from the ‘tried and tested’ horizontal, straight and rectilinear forms. To do that, offset curved objects with those that have stricter, defines, linear shapes and use round potted plants or exotic porcelain vases to get this marriage going! 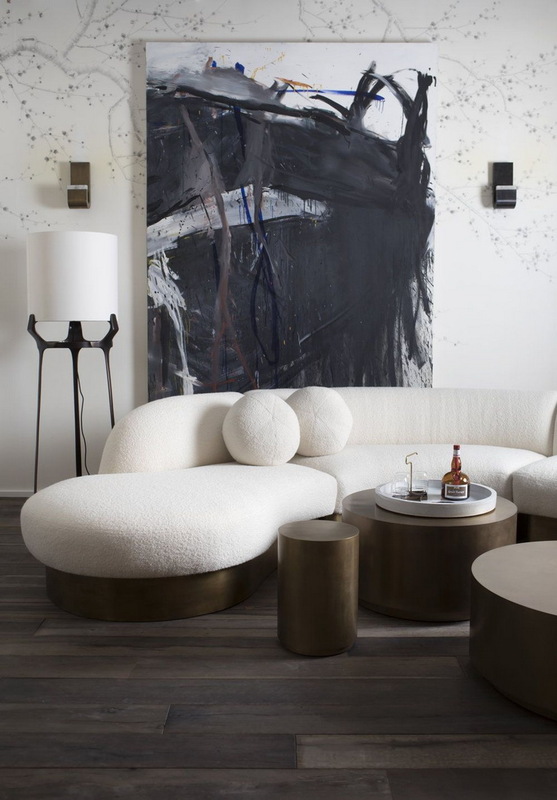 An even better way to get the amalgamation in the blend is by using curved side-tables with soft, rounded edges, and intricate, swirly mirrors on walls. Or on the other hand, soft, circular footstools (hassocks) and ottomans combined with rotund pendant lighting will also make for an awww-worthy combination. 4. When life throws you a curve ball – RUG it out! If you’re stuck with a rectangular dining table but want to create an interesting conversation starter with smart décor items around the house, give this one a go. A largish round rug placed under a rectilinear dining table or a smallish one set underneath a square coffee table will make for an exciting interplay of geometric shapes in the house. Choosing washable hand-woven rugs that have mixed patterns such as flowery prints with artsy designs or bright and breezy stripes with the oh-so-much-fun polka dot outlines will jazz things up a notch higher. Introduce color/texture pops by placing square, rectangular shaped rugs below the round one and you’ve made a bold, eclectic anchor point in the room. Besides, do remember that this is one of the easiest ways of introducing circular elements in the house without making huge monetary investments – so you can go right ahead and RUG it out! Don’t curves appear to be the right way to go? If you are looking for a makeover for your home, get in touch with one of our experts today! Newer PostAvoid These Common Mistakes When Getting Your Bathroom Done! Older PostLove Metal Furniture? Make Note Of The Pros And Cons Before Taking A Decision!